Gupshup, a cross-channel bot platform, today announced the launch of two new development tools — Flow and Template Bot Builders — to make chatbot building easy for anyone regardless of their technical skills. Available on Gupshup.io, the Bot Builder tools use simple drag-and-drop tools and pre-selected menus. Combined with its existing IDE Bot Builder (a tool for technical developers), the company claims that its Bot Builder suite of products now caters to everyone from enterprises and small- to medium-sized businesses (SMBs) to individual bot fans across the globe. “Chatbots once required an advanced level of IT knowledge in order to build something that was both fun and functional for the end user. Our goal is to make it fast and easy for bot builders to make engaging and advanced bots irrespective of their technical skills,” said Beerud Sheth, CEO, Gupshup. The Flow Bot Builder enable users to develop a chatbot in an entirely code-free manner. Using a graphical, easy-to-use, web-based interface, users can simply design the conversational flow for the bot. For example, a business analyst can quickly define the navigation flow with a series of menu choices. Hence, the company explains that Flow Bot Builder makes it simple to create a variety of engaging chat bots, from informative to entertaining, without entering a single line of code. The Template Bot Builder gives entrepreneurs and small business owners the ability to capitalize on the exponential growth of chatbots using pre-defined templates that are fully customizable to fit their audience and brand. For example, a restaurant owner can use a pre-defined bot template that already has food browsing and ordering functionality coded in it. Business owners can go from idea to launch with the push of a button in as little as a few minutes. From e-commerce to order management/fulfillment, this builder is designed to offer the chatbot functionality that SMBs need to build and increase customer engagement across mobile platforms. 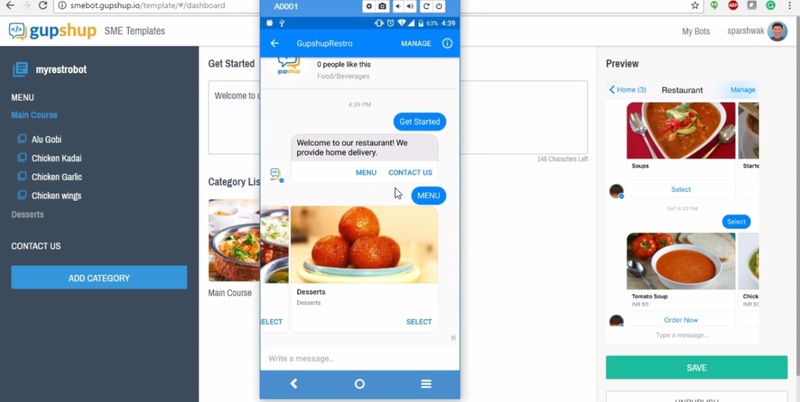 Having previously helped large companies like Barclays and Sage Software and partnered with Cisco Spark and Twilio to target enterprise customers, Gupshup seems to be working itself to the ground in driving the chatbot movement, providing the necessary development tools and industry expertise.